Now this is a strange one, in that I'm not 100% certain that the object that appears in these photographs, is actually the cairn. The day that I went searching for this site, I was only able to find these slight landmarks in the area in which the maps pointed. If you know otherwise, please let me know. The cairn is directly in front of the small shelter. Berry Holme round cairn, is a small burial cairn situated to the West of the A6 dual carriageway, on the public footpath that leads to Brigsteer about two miles to the West. The cairn is a simple mound about 1.3 metres high, is oval in shape and has a scooped area to its side containing rubble. The cairn would have contained one or more burials, which may still be there if the site hasn't been robbed. The cairn is directly behind the shelter on the right. 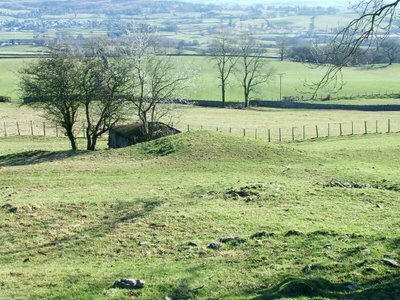 The cairn has a small hut\shelter built into its side (no antiquity) and this has partially destroyed the site on one side. The cairn is a bronze age structure, so is probably between 4500 and 2500 years old. Difficult to date! !